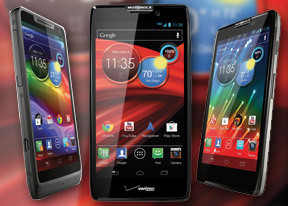 The Motorola RAZR M and Motorola DROID RAZR M might be the most affordable among the new members of the RAZR family, but that doesn't mean that too many corners were cut. The smartphone felt almost as solid as the RAZR HD in our hands and its user interface was really snappy. Not that we expected anything else, given the relatively modest qHD resolution and the powerful Qualcomm S4 chipset under the hood. Speaking of qHD resolution, we have to say that the PenTile matrix of the screen is the only grudge we have with this phone. It's the same 4.3" unit we've come to know since the original Motorola RAZR and we liked it quite a lot back then, but it doesn't come anywhere near the image quality of the 4.7" 720p screen of the RAZR HD. Yet, if you consider that this is the only area where the Motorola RAZR M is lacking compared to its more expensive siblings, it's probably a fair trade. The Motorola RAZR M should be the dream device to everyone who ever complained that they need to carry a huge smartphone if they are to have top-notch processing power on Android. Well, the Qualcomm S4 might be two-cores short of the Exynos 4 Quad and the Tegra 3, but it's holding its ground in benchmarks and it certainly provides more than enough processing power to the RAZR M.
Plus, the dimensions of the smartphone would normally only fit a 3-point-something-inch screen - it's not that much bigger than an iPhone 4S and its 3.5" screen.